I celebrated my daughter’s third birthday this past weekend. 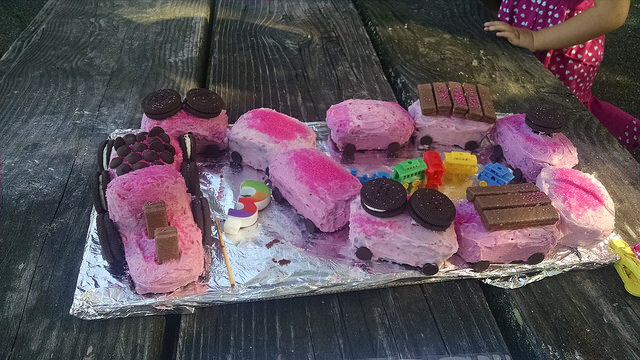 She asked for a train-themed party, so of course we had to have the obligatory pink train cake (it sure felt obligatory based on how insistently she asked for it). Pink Chocolate Choo Choo Train cake, as requested by the birthday girl. Although we had it at the park intentionally so the kid guests (and grown ups) could run around and climb on things, I also wanted to offer some sort of “activity” the kids could do while the parents actually sat down to relax and enjoy other adults’ company. I grabbed four largish boxes and brought them to the park, along with crayons and stickers. I set the boxes up to look vaguely like a train, with one taped to the front box like it was a smoke stack, and invited everyone who wanted to to decorate the train as they saw fit. After they ate their cake (because, priorities), the kids all jumped into the train, from the one-year-old to the five-year-old, and proceeded to stay there for almost an hour jumping in and out of the boxes, decorating, adding stickers, often tipping the boxes over and falling out onto the grass, but laughing and getting right back in. It was definitely the highlight of the birthday party. I am glad that I took a chance and brought these boxes and crayons for the kids. It cost no money (I had all of these items laying around my house already), and it let the kids do some creative make believe play that they might not have gotten to do otherwise. It was something that all ages of kids could do independently or collaboratively as they so chose. 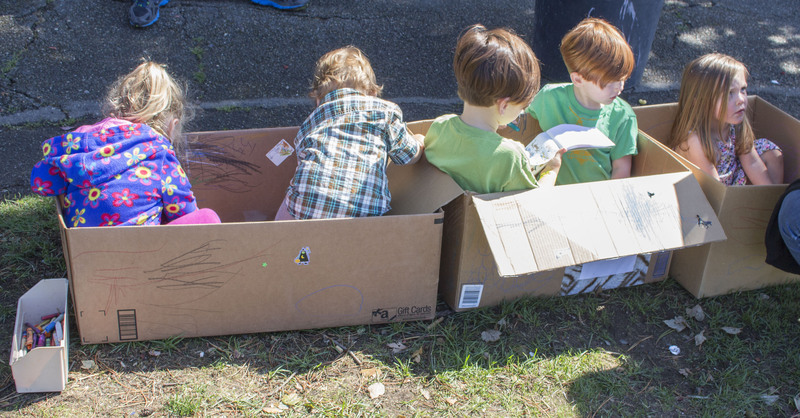 Parents lament that kids tend to like the box more than the present that came in it. I say bring on the box!